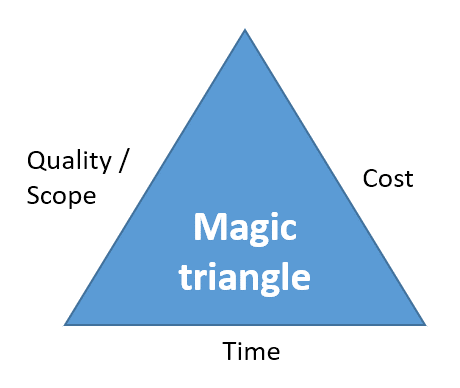 We have created this Magic Triangle diagram which demonstrates what happens when you need to increase scope, increase speed or reduce costs. you can come up with some magic. Before using this diagram, please read our blog post to understand how to use the Magic Triangle correctly! Sign up to my updates and get the link to this free Download now! Sign up to my updates and get your FREE download! After having inserted your infos here and confirmed your email address, you will get an email with the link to our downloads page and the password to enter it. Check your spam folder, just in case. With your clicking on the red button “Yes, sign up…” you agree to “buy” this awesome tool by “paying” with your email address and allowing me to send you my regular updates which contain a great deal of high-quality helpful project management tips and from time to time a little info about a new product or service. Of course, you can unsubscribe at any time. I think, this is a fair deal as I spend hours on generating free content which you get at no charge in exchange for your email address. If you think, it’s not, just keep away.